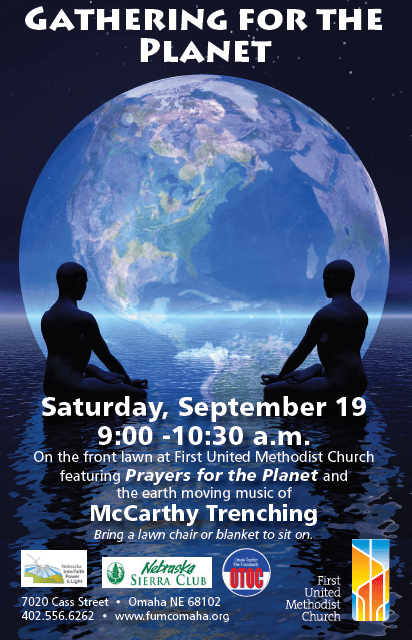 Omaha Together One Community (OTOC) along with First United Methodist Church and other partners will hold a “Gathering for the Planet” on Saturday, September 19 from 9 to 10:30 a.m. on the front lawn of First United Methodist Church (7020 Cass St.) You may wish to bring a lawn chair or blanket to sit on. The morning is organized in response to and in celebration of Pope Francis’ recent Encyclical Laudato Sí and in support of a world-wide response to the UN Climate Conference in December. The morning will feature education about climate change, the moving music of McCarthy Trenching and “Prayers for the Planet”, where local clergy and faith leaders will share the key teachings of their faith regarding Care for the Earth. This gathering will happen, rain or shine so come join us.